The climate, land and natural resources that were available to the Indian tribes resulted in the adoption of the Sub-Arctic Indians culture. Food: In the summer food was stored in pits in the ground or bags suspended from poles. An edible food called pemmican was prepared by the women through a process of drying, pulverizing and then mixing it with fat. Pemican remained edible for over a year. During the winter food was also preserved by freezing. Native sub-arctic peoples have over 30 languages, falling into two major language families: Algonquian and Athapaskan. 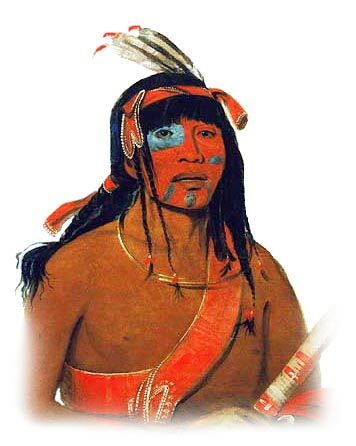 The Algonquian peoples tend to live in the east of the region, whilst the Athapaskan speaking peoples live more in the west. The animals were very important to the Sub-Arctic Indians. The animals available to the Native Indians of this group were Caribou, moose, elk, deer, wolves, bears, ermine, rabbits, hyena and lynx. Fish included Pike and Salmon. The uses of the animals were varied and included food, clothing, shelter and decorations. The dominant vegetation is a peaty herb land dominated by grasses and sedges. Tall cedar trees. Coniferous forests. The soil was poor and often swampy. The different types of Houses, Shelters and Homes depended on the materials available and whether the home was permanent or temporary. Many of the tribes were Nomadic and used a variety of houses and homes including Wigwams, Pit houses, tepees, smokehouses and lean-to's. Animism was a commonly shared doctrine, or belief, of the indigenous people of North America and Canada including the Sub-Arctic Indian tribes. Animism is based on the spiritual or religious idea that the universe and all natural objects have souls or spirits. In this religion it is believed that souls or spirits exist not only in humans but also in animals, plants, trees, rocks etc. This belief is also extended to natural phenomena such as thunder storms and rain and geographic features such as mountains, caves or rivers also possess souls or spirits. Tricksters feature in the legends and mythology of the Sub-Arctic peoples as do heroic figures "transformers" who transform, or change, the world into its present state. The Religion, Ceremonies and Beliefs of the Sub-Artic Indians were also dominated by Shamanism in which a religious leader called a Shaman acted as a medium between the visible and spirit worlds. The Geography and Environment can be generally described as a flat, treeless tundra to evergreen forests and glacial lakes in the North to deciduous forests in the South. Long, cold, snowy winters and short, warm summers.